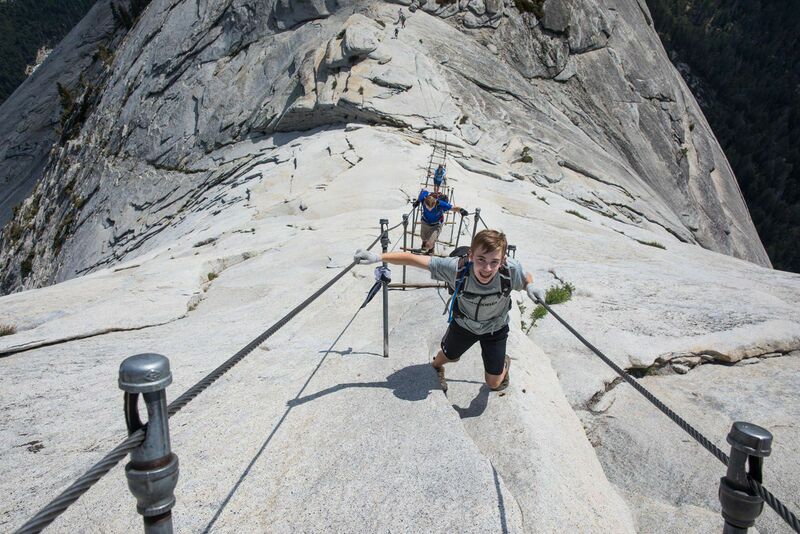 Have you ever wondered what it is like to climb the Half Dome cables? 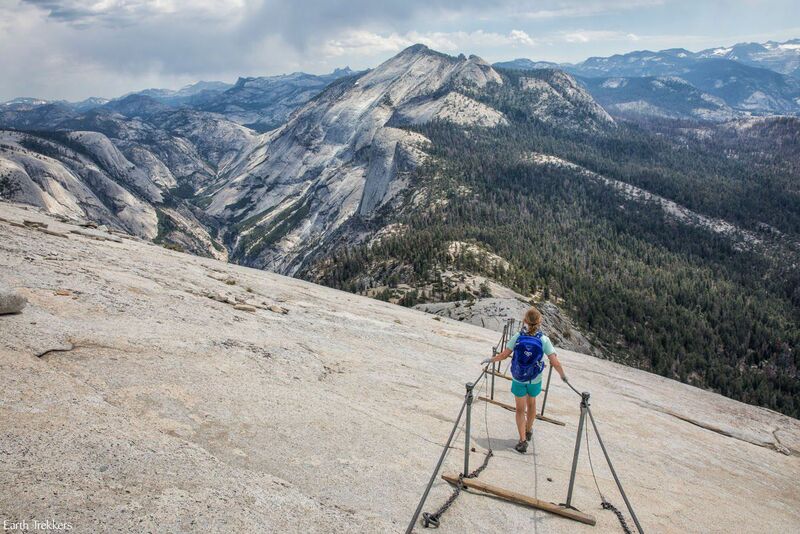 Did you even know that hiking Half Dome was something you could do? 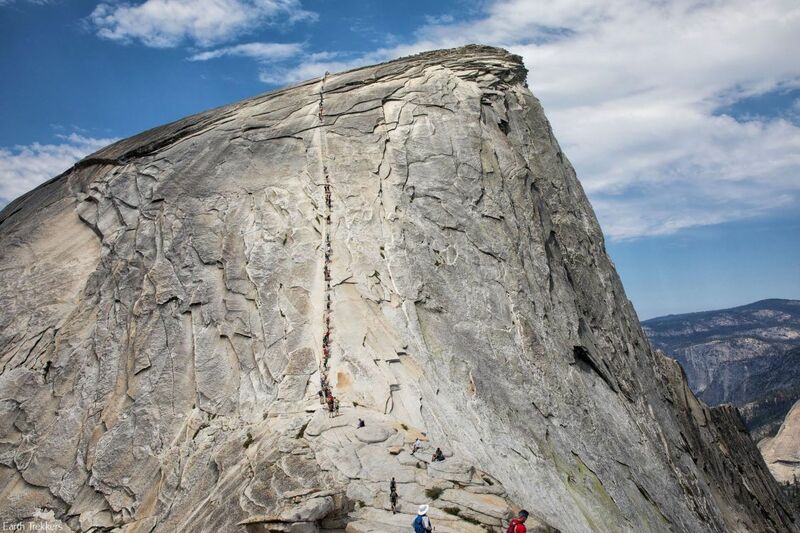 I will admit it, just two years ago I saw my first photos of people clinging to the steel cables on Half Dome, climbing one of Yosemite’s most famous icons. 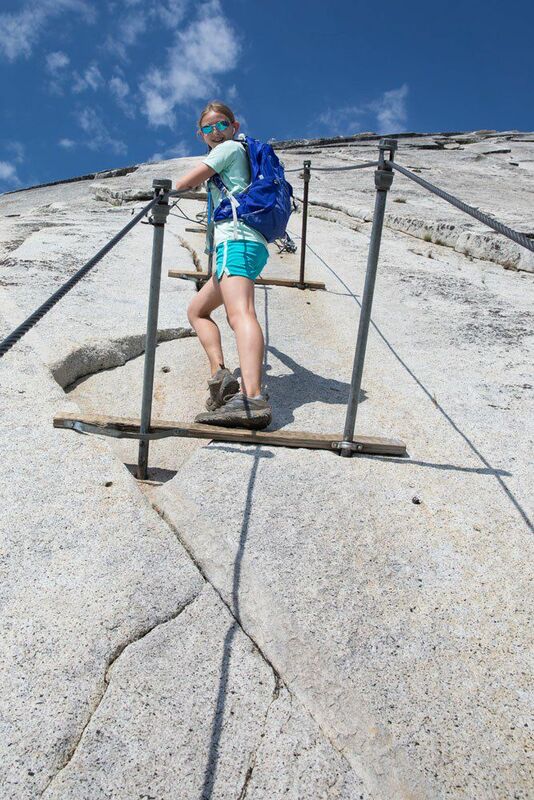 Instantly, this hike got added to our bucket list.This summer, with a trip to Yosemite, we got our chance to hike up the Half Dome cables. In March we applied for our permits and in April we found out we were one of the lucky 225 applicants for July 6, 2017. This was a thrilling experience for our family. It’s challenging for fit adults, but Kara was only 12, and Tyler was 14, when we did this hike. 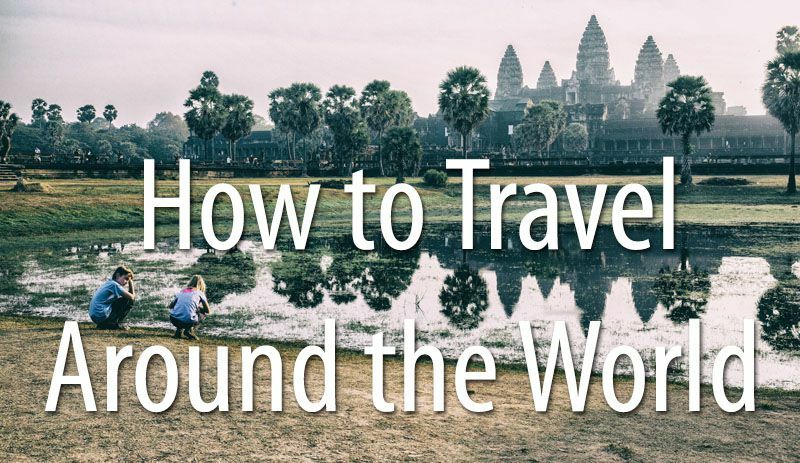 This is a major accomplishment for all ages, but Tyler and Kara continue to amaze us, with their endurance, stamina, and love of crazy experiences like this, just like their parents. Our day started at 6 am, when we took our first steps on the Mist Trail from Yosemite’s valley floor. For four hours we hiked uphill, past Vernal Falls, past Nevada Falls, past campsites, and then higher than Yosemite Falls and Glacier Point. 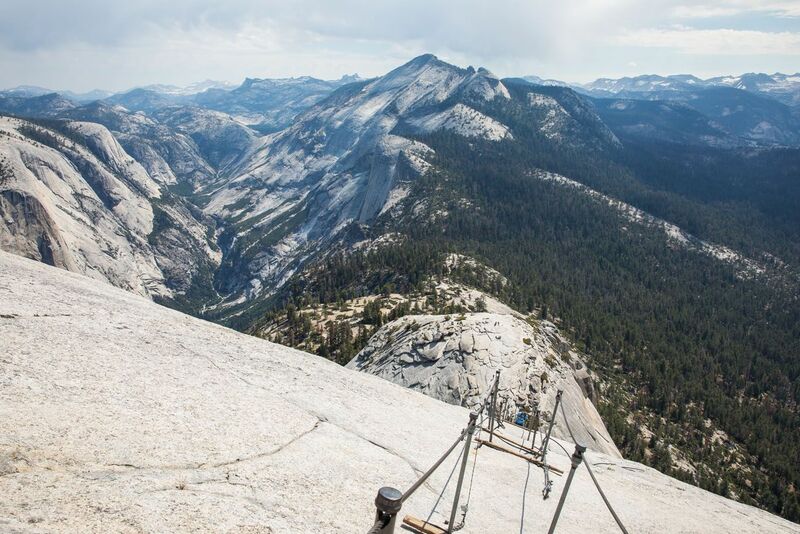 From the sub dome, which is a smaller version of Half Dome, we got our first real view of those infamous cables. At 10 am we were staring up at Half Dome. With our early morning start and fast hiking pace (yes, even with kids) we got here before the main crowds arrived. 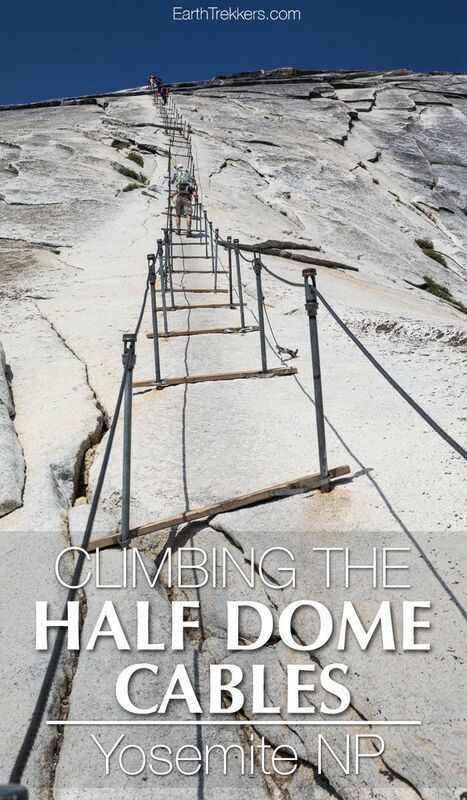 Until 2010, Half Dome could be hiked without a permit. If you see photos from this time, there would literally be hundreds of people clinging to the cables. This created a dangerous situation, with too many people precariously hanging onto the cables. One wrong move could mean disaster. 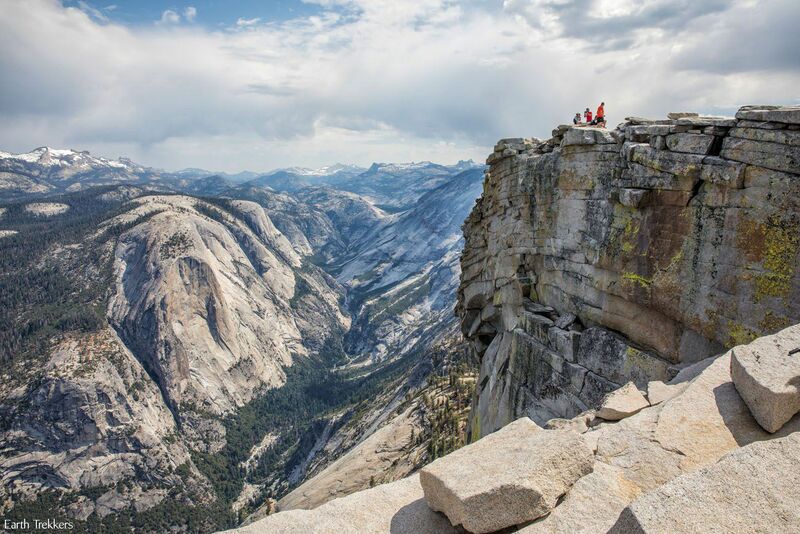 In fact, 20 people have died climbing Half Dome, either from falling off the cables, having a heart attack, being struck by lightning, or from failed base jumps. 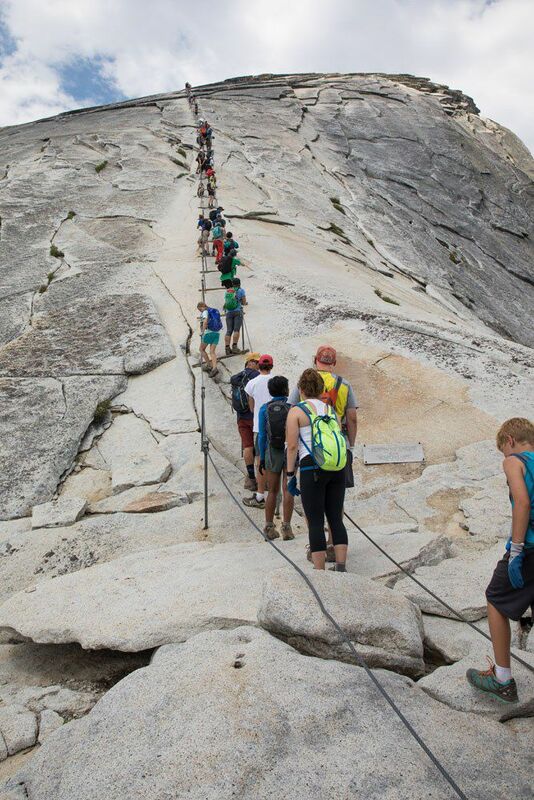 Now, with the permit system in place, the number of people on Half Dome is much more manageable. Still, it helps to get here early, not only to avoid the crowds but also to avoid afternoon thunderstorms. Half Dome is NOT a place you want to be in rain, thunder and lightning. Our climb up was quick since there were very few people in front of us. I knew to expect a steep incline and slick surfaces, but even so, the difficulty of this climb took me a little by surprise. This climb is hard! Don’t underestimate it. The granite surface has been worn smooth by the shoes of the thousands of people before us. The climb is so steep that we pulled ourselves up more with our upper body strength than by walking up with our feet. And since the elevation is now over 8,000 feet, it doesn’t take much to get out of breath. Plus, we already hiked for 4 hours, so we were already fatigued. This is not easy. But it is thrilling. We would climb a short distance, rest and catch our breath, and then keep going. 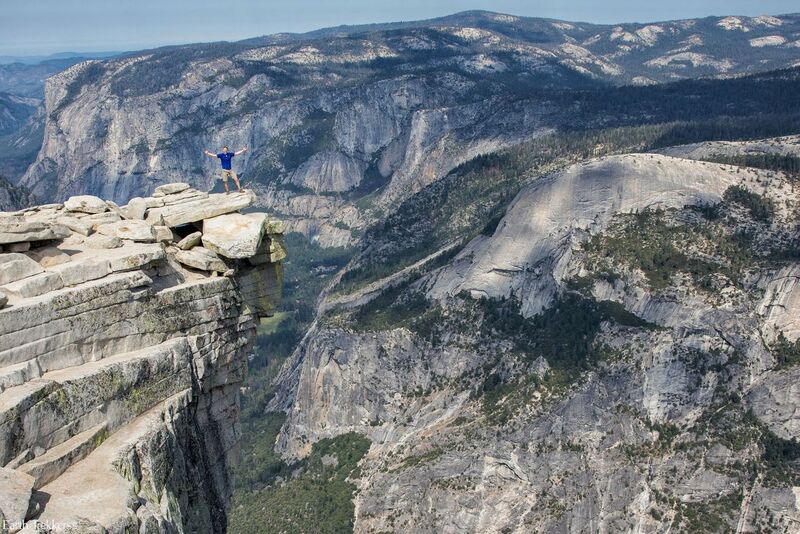 It’s exhilarating, looking out at Yosemite and down the cables.It’s a relief to finally reach the top. We made it!! Now we could take in the view and enjoy our accomplishment. I planned on a longer stay here than what we actually did. 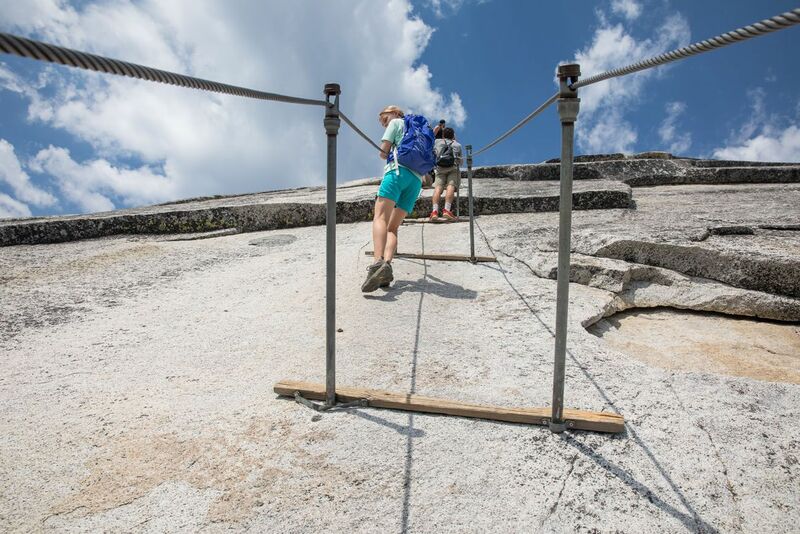 But rain clouds were in the area, and now knowing just how steep and slippery Half Dome is, we did not want to be on those cables if it started raining. After a few photos we headed back down the cables. If you are not afraid of heights, going down is much easier than going up. We figured out that turning around and walking down backwards is much easier than facing forwards. Plus, wearing gloves is a must!! As you slide down, your hands rub on the cables. Without gloves, you will rub the palms of your hands raw. All four of us made it safely to the bottom. 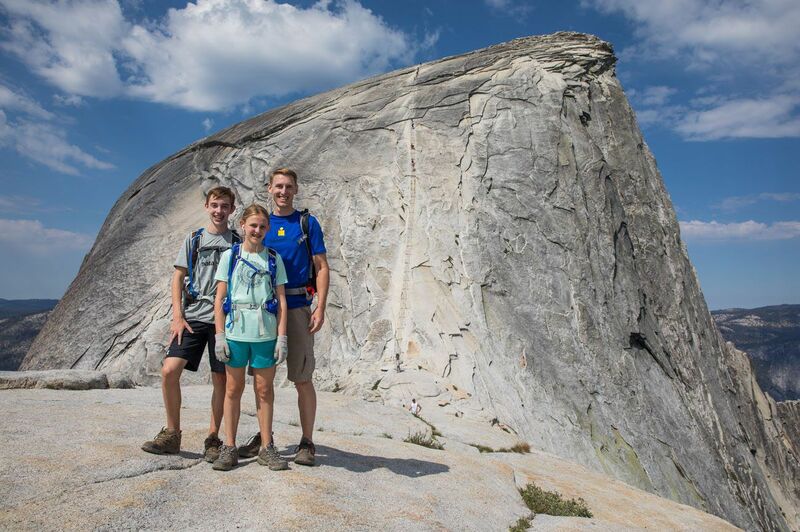 After getting one last look at the cables, we hiked down the sub dome (and it did rain…a little bit), and then to Yosemite Valley.Climbing the Half Dome cables was a thrilling experience, probably one of our favorite family experiences of all time. 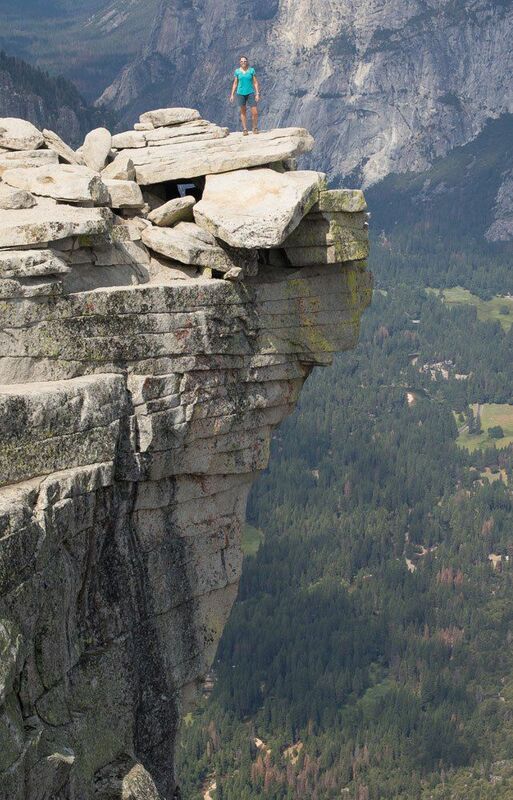 We will never look at Half Dome the same way again. Watch the weather. 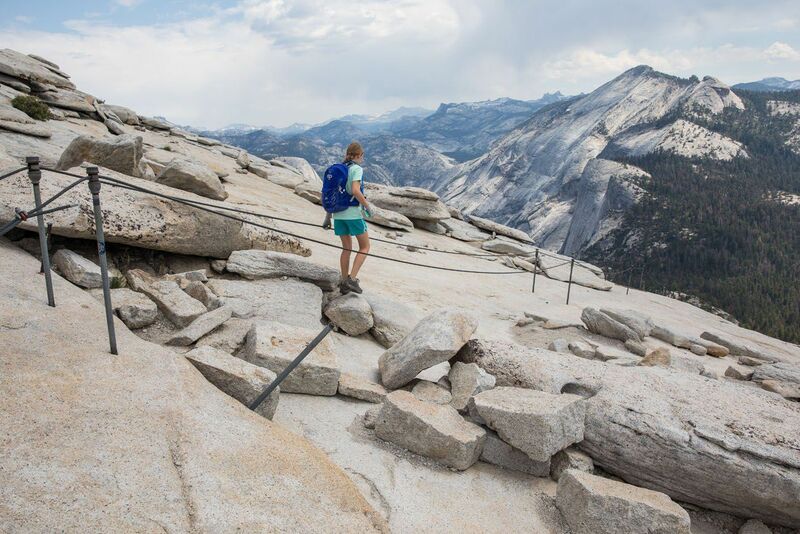 If it is raining or storm clouds are in the area, do not hike up Half Dome. 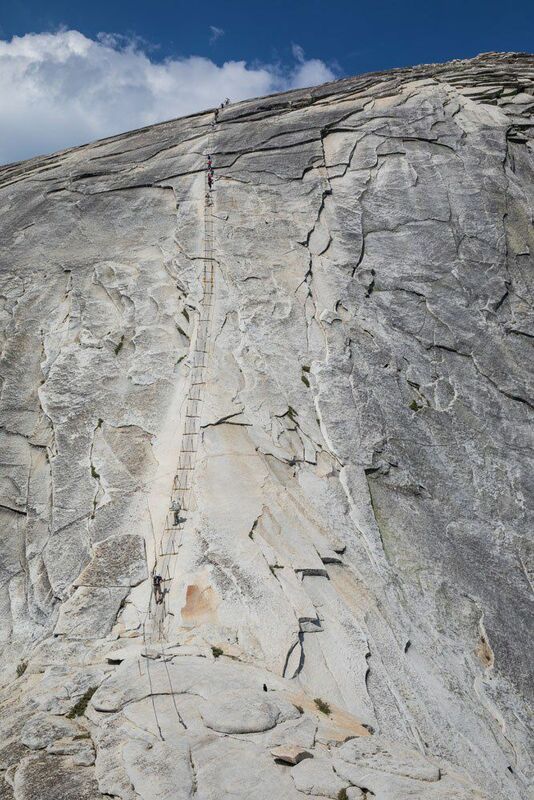 People have been struck by lightning while on the Half Dome cables. 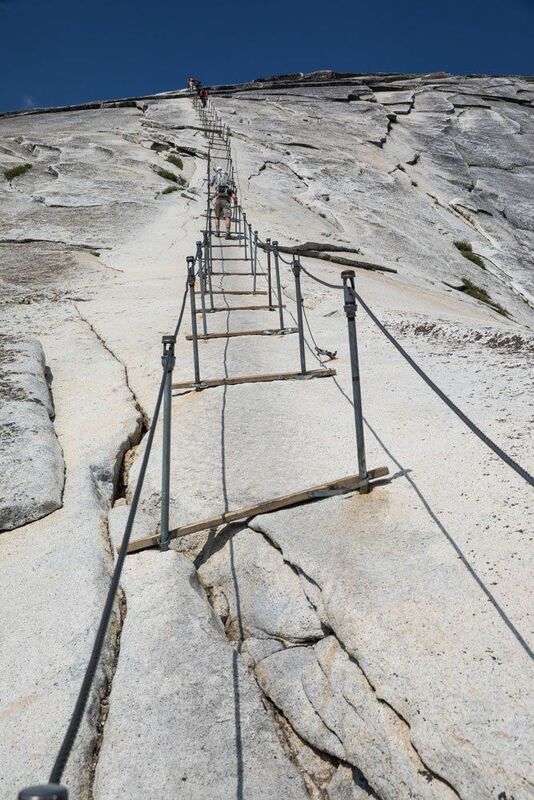 Plus, the granite rock is already slippery…if it is wet, climbing the cables becomes very, very dangerous. Bring gloves. Without gloves, you risk rubbing the palms of your hands raw while climbing and descending the cables. While we were here, there was a pile of discarded gloves at the bottom of the cables you can borrow. Take your time. Be patient with slower hikers. While climbing the cables, we pulled ourselves up with one hand on each cable. There are plywood boards spanning the cable route at each of the poles. This is a good place to stop and rest. Climb to the next board, take a short break, and then climb to the next board. It’s harder to pause in between boards because the granite rock is so slippery. When descending, it’s easier to turn around and walk down backwards. Keep both hands on the cables. Again, pause on the plywood boards, not on the slick granite trail. You have the option to bring a harness and clip onto the cables. This is the best way to stay safe while climbing and descending the cables. 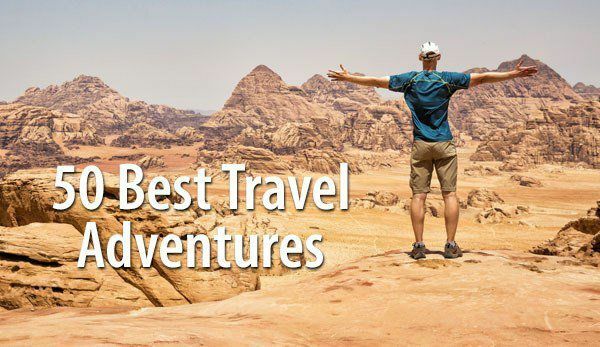 If you plan to do this, you will need a harness, carabiners, and a Y-shaped lanyard. 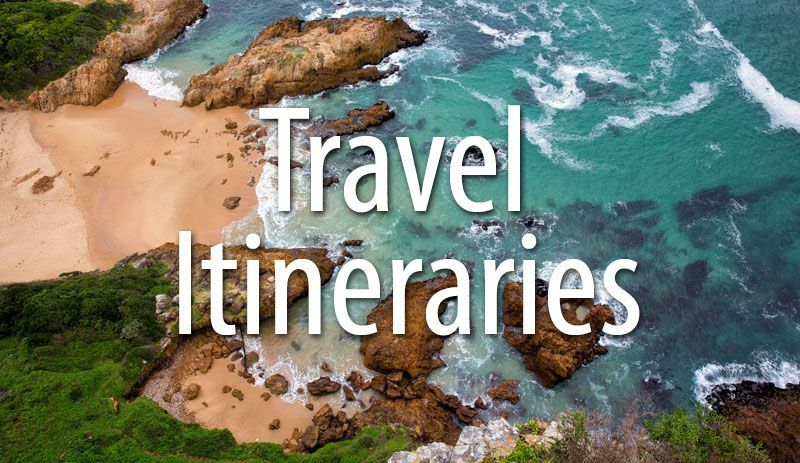 Or check out our Hiking Page for more awesome hikes around the world. 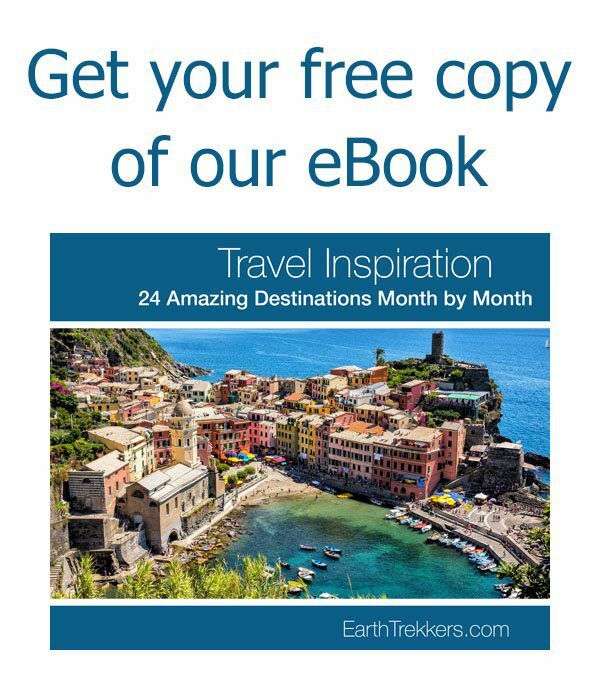 Just love your Mini-Website with all the info. Thank you. Just a quick a question: can I start hiking at early as 4AM? 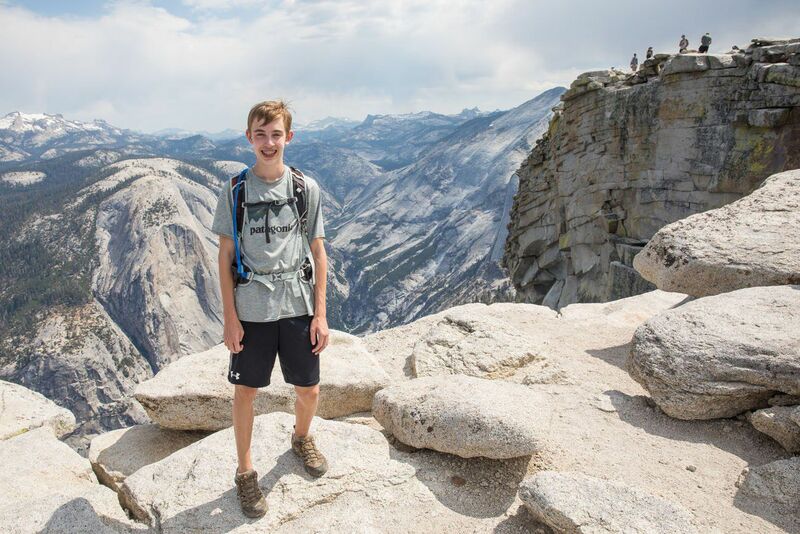 I’ve hiked to the top of Half Dome many times over the past 25 years. 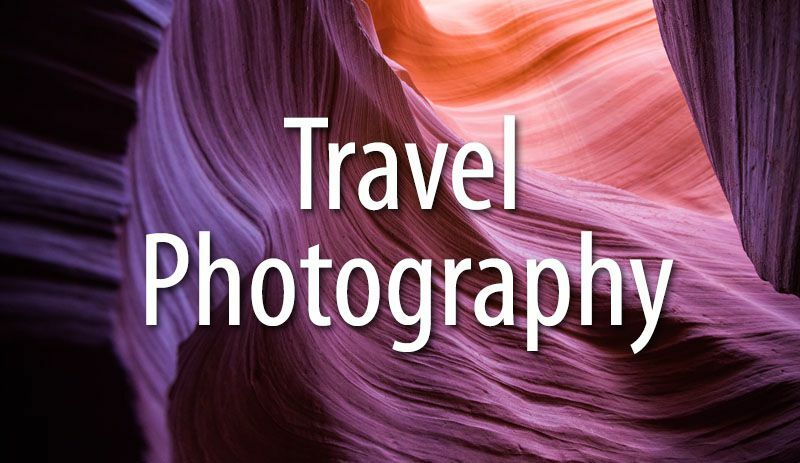 Your description and photos are very well done. It is a challenging hike, but I’ve seen a boy as young as 5 at the top and a 75-yeard old couple from Japan (celebrating their wedding anniversary) at the top. 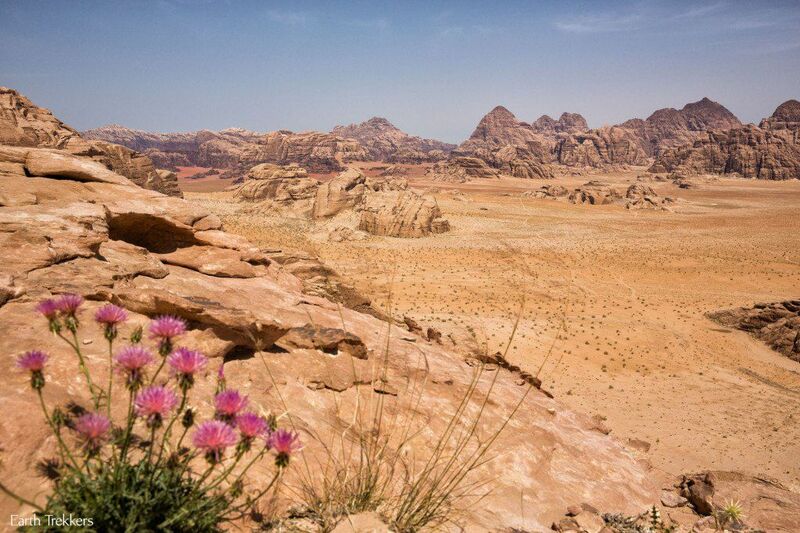 So it is a doable hike for relatively fit people — if you have the desire. 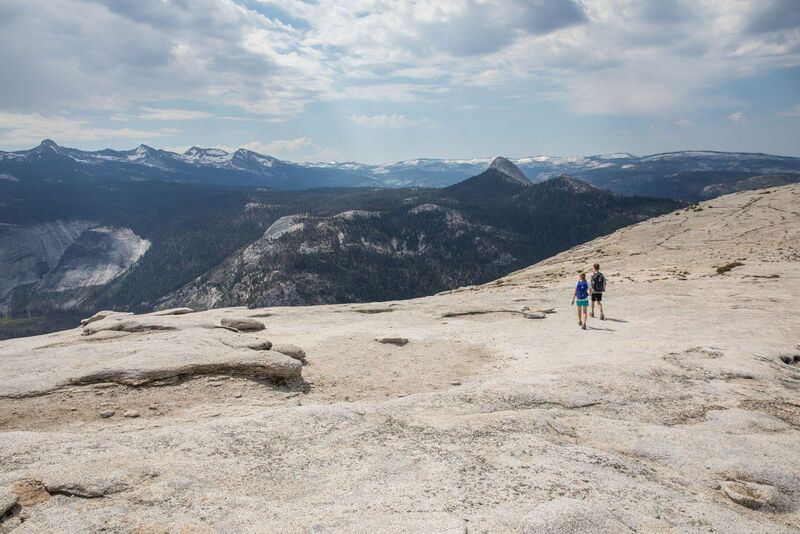 The Half Dome hike is definitely one of the great day hikes. 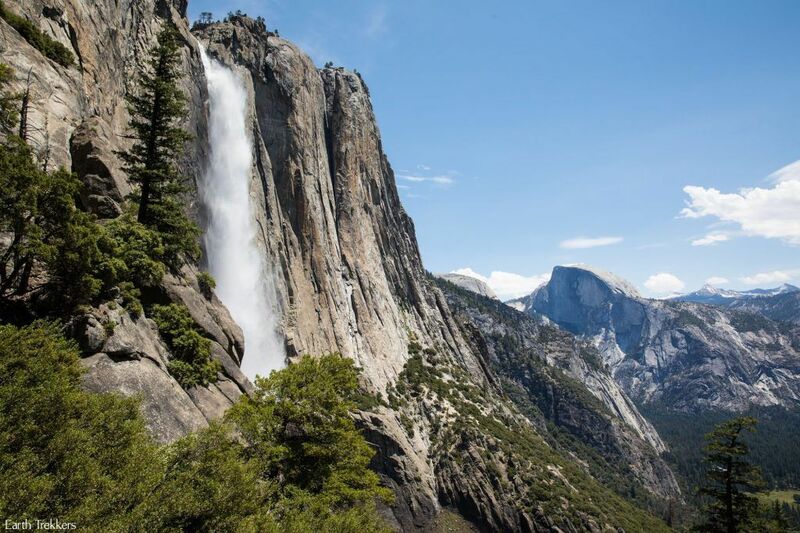 By the way (and not to be critical because most make the same mistake) it is Vernal Fall and Nevada Fall, not Vernal Falls and Nevada Falls. Bridalveil Fall, too. 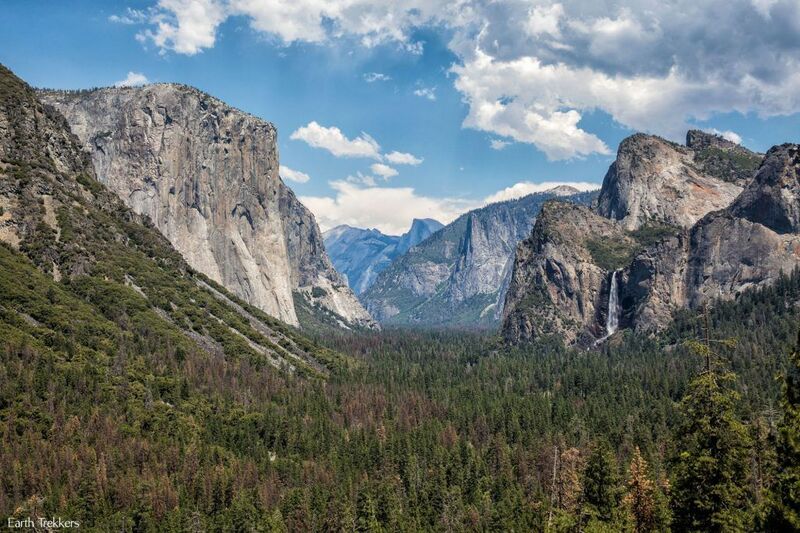 Yosemite Falls is plural because there are the upper, mid, and lower sections. But the other three are singular. 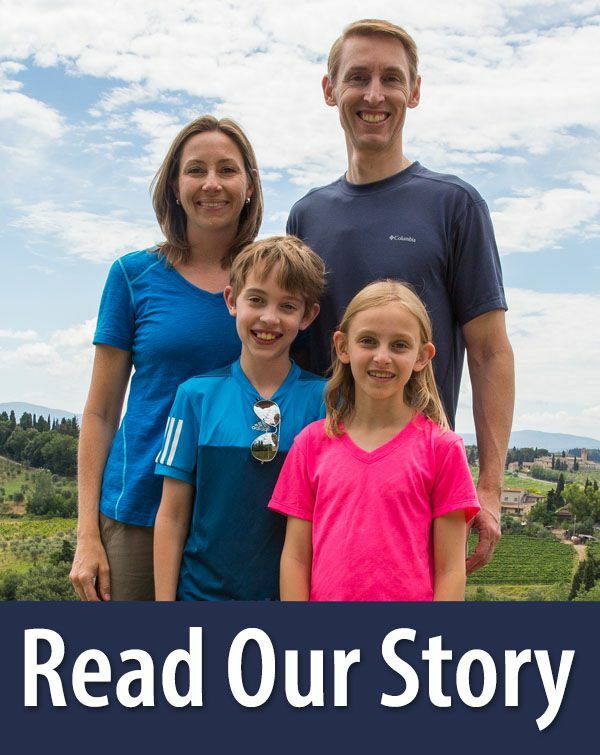 It seems to me that taking such young children on such a dangerous and demanding hike isn’t particularly safe, especially if you didn’t use safety harnesses. 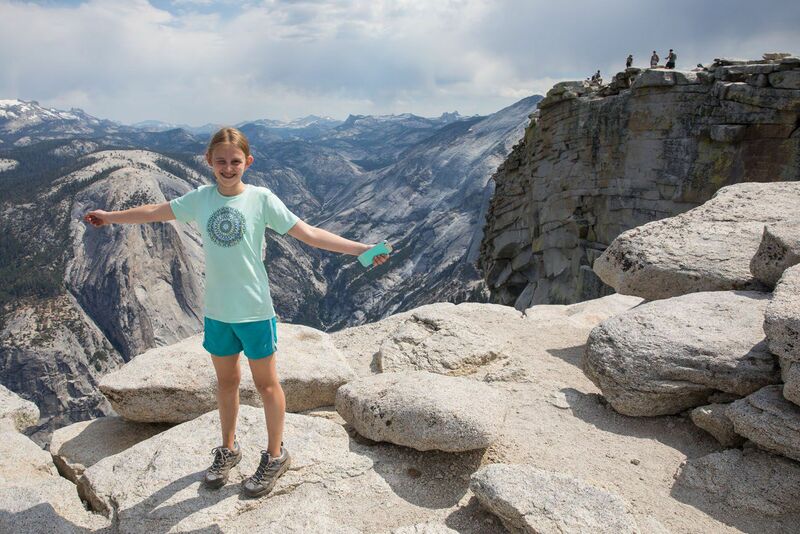 People die climbing half dome, and just in my personal (and possibly uninformed because I don’t know much about hiking) opinion it seems difficult to understand why children would be allowed to take that risk. I’m not leaving this comment to be critical, I am just genuinely curious about your reasoning for allowing your children to make a trek like this and wonder whether you can explain your feelings about what is and isn’t safe in terms of adventuring with children. I don’t know much about hiking so maybe I’m misreading the situation and it actually wasn’t as dangerous as it seems, and if so maybe you could enlighten me a little about the situation. 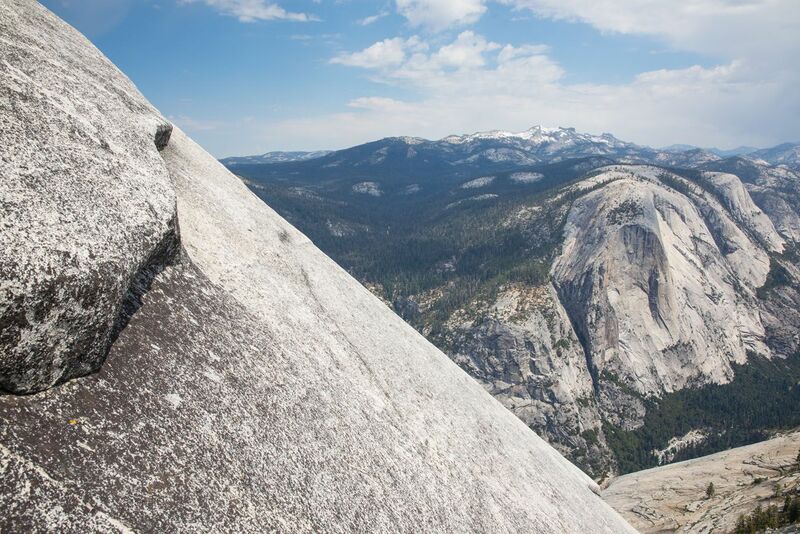 Your story of climbing Half Dome brought back a lot of good memories. On July 19th 2003 I climbed it but forgot to bring my camera. If there is anyone out there that summitted HD that day (noon) I might be in one of their pictures. I’ll gladly pay to get a copy. I know this is a long shot but it doesn’t hurt to ask. It’s not climbing. It’s hiking. Big difference. What time does the crowd gather? My group wants to start at 3am. Would you know the latest that they allow to climb? How long did it take you climb up and descend down since there wasn’t that many people during your timeframe? How would park rangers know if you have a permit? On the day we did this, the cables started to get crowded around 10:30 am. It took us 20 minutes to climb up (no crowds) and 45 minutes to climb down (with crowds). Park rangers can be stationed at the subdome checking permits and your ID (to make sure they match). I don’t think that there is a time limit, but you should make sure you have enough daylight to hike back to your car. That will depend on day length and time of year. 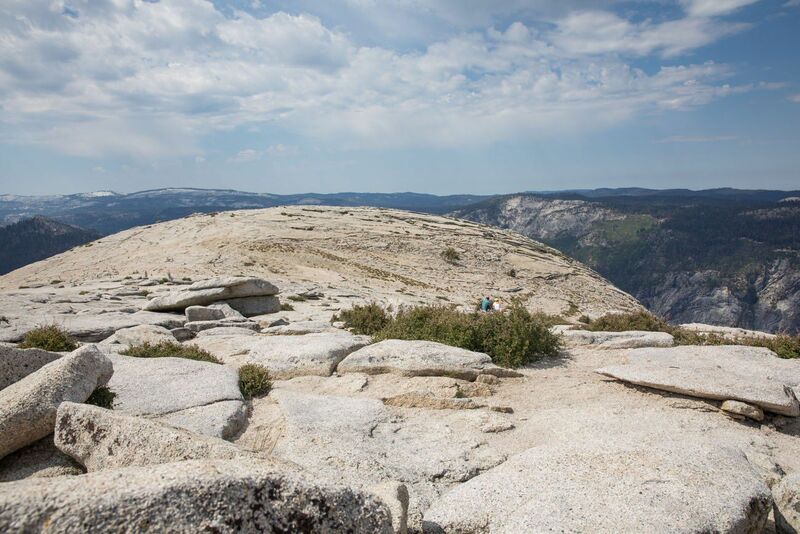 For more info on hiking Half Dome, here’s our post with more details. Thank you for posting tips on applying for a permit and what to expect on the hike. 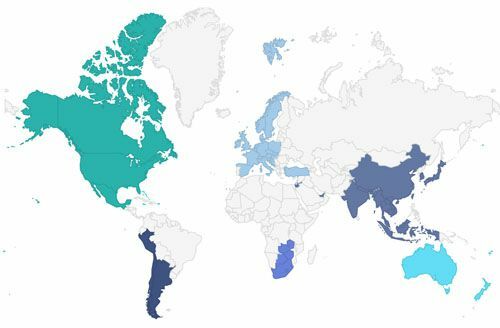 I’m planning to apply for a June 2018 hike, and your posts are very helpful.